Bronze Apollo statue found in Piraeus in 1959 and restored in the National Archaeological Museum (photo credit: National Archaeological Museum). Lecture by Georgianna Moraitou entitled “180 years of archaeological conservation in Greece. From a technical occupational role to the profession of the conservator of antiquities and works of art and the discipline of conservation”. Conservation of antiquities as a state concern, just like Greek archaeology, is simultaneously born with the Greek state in the second quarter of the 19th century. Our knowledge on the conservation in the Othonian period is still limited, never the less the contribution of chemistry, art and technique are attested. 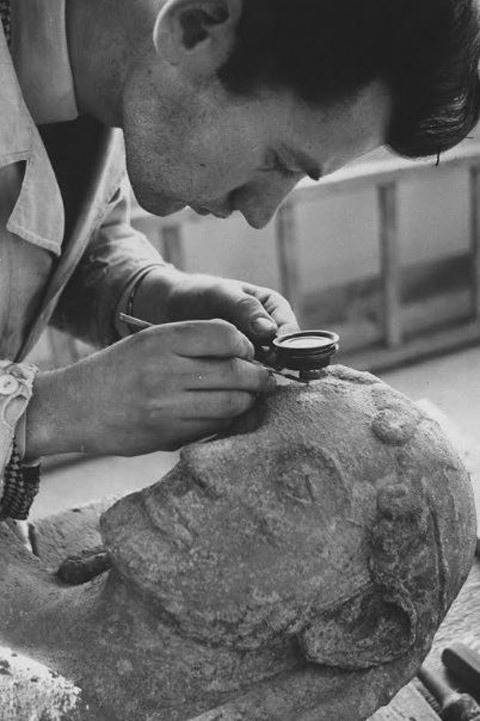 On the contrary since 1888 there has been abundant evidenceand one can follow the evolution of conservation and the slow emanation of the conservator of antiquities and works of art as a profession from the fourfold origin of his discipline: chemistry, art, technique and archaeology. In addition it is clarified that the evolution of conservation in Greece complies more or less with the international course. Starting from a technical occupational role to the profession of conservator of antiquities & works of art leading to a discipline through its introduction to the Technological Institute of Athens and since 2018 University of Western Attica. In the present paper references are made to known and unknown institutions, structures and people who contributed to the formation of the modern profile of the academic conservator.